Y’all, I am back! I had my mutant parathyroid glands removed last week, and I already feel a hundred million times better! Hurray for not being sick! Wow, what a difference! Remember, y’all, high calcium is BAD but you can fix it and be better than ever in under a week if you have a good experienced surgeon. ANYWAY, where was I? I was working on this gorgeous beautiful hardanger pattern! I finished it, and it is just lovely. The white is a silk perle thread. I used a larger size thread than the pattern suggested, which creates some interesting dimensional effects. As I mentioned before, the variegated floss is from The Gentle Art and the embroidery pattern is from The Victoria Sampler. They have a brand new Summer Box pattern, which is awfully pretty as well. So glad to be back, y’all! 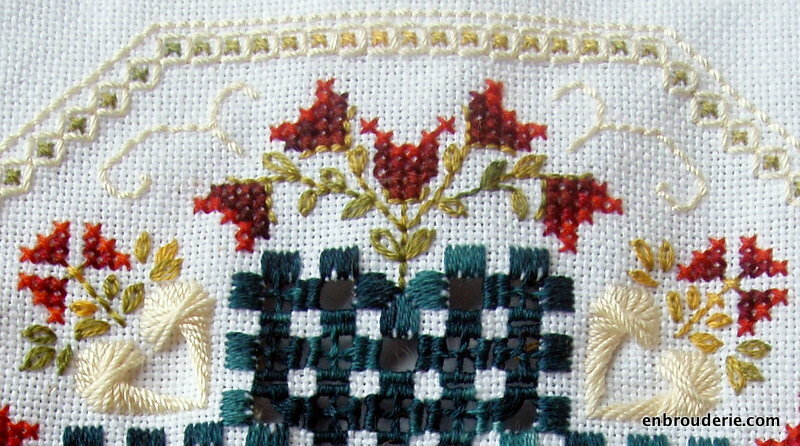 This entry was posted in Hardanger, My work and tagged embroidery, hardanger, parathyroid, spring box, the gentle art, victoria sampler. Bookmark the permalink. You’ve been missed! This piece is gourgeous, as usual. Glad you’re feeling better! I’m glad I’m feeling better too! Ha! Well done – and yes, good to have you back! Beautiful ! Well done! 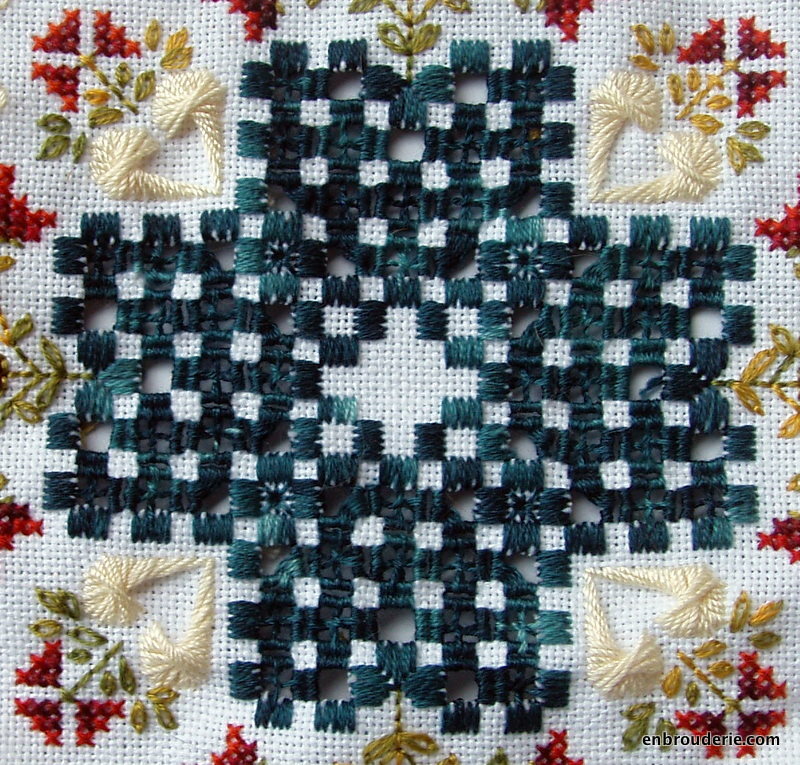 Love the colours .Hardanger is addictive,isn’t it? It’s good to have you back Hannah. Good to be back! I need to finish up my lovely chikankari piece! Welcome back ! I’m so glad you’re better now! Your work is just beautiful! Good to see you back and in good spirit!! was thinking about you yesterday on my way back home from Santa Fe–The Santa Fe International Folk Market. I volunteer for two days–it was wonderful!! Now, since you are full of vigor, think about attending next year. Great to hear from you! I would love to go to the market next year! I love this one, the colours are gorgeous – I love blue so it’s a bit of a no-brainer. Glad to hear you are feeling better. I would really appreciate an email to tell me what your symptoms were etc as I have had problems with parathyroid in the past but my current doctor isn’t very interested. Keep going on the hardanger, it looks fantastic. Nice to have you back, Hannah! I was thinking of you a couple of days ago and wondering where you were! I thought you were still slogging through the dissertation. 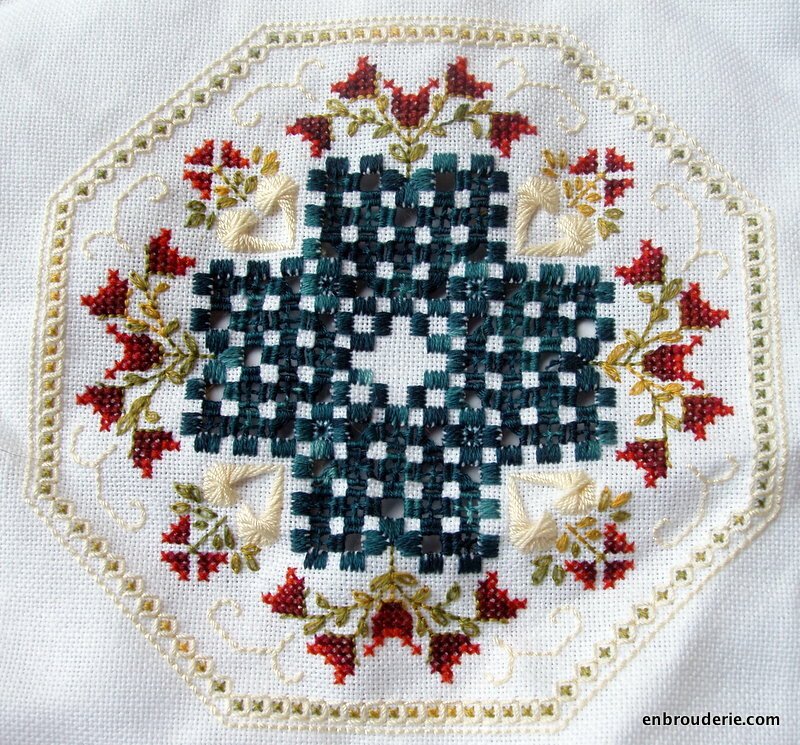 Love this Hardanger pattern and agree that the larger thread gives interesting texture.